The Louise Noun – Mary Louise Smith Iowa Women’s Archives opened to the public twenty-five years ago on October 28, 1992. The Archives celebrates 25 years of gathering and illuminating the history of Iowa women with a series of events and exhibitions in 2017/2018. 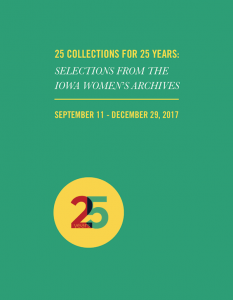 The exhibition 25 Collections for 25 Years: Selections from the Iowa Women’s Archives will feature items from 25 of the more than 1200 collections in the Archives, providing a peek into the development and use of the Archives since 1992. A series of events will take place throughout 2017/2018, kicking off in July 2017 with the exhibition Power to the Printers: The Alternative Press in Iowa City, 1965-1985 and a reunion of Iowa City feminists who were active in the Women’s Liberation Front and other feminist activities in the 1960s, ‘70s, and ‘80s. A 25th anniversary celebration of the Iowa Women’s Archives will take place in the Main Library and the Old Capitol Museum on November 10-11, 2017. And in the summer of 2018 we’ll recognize the long tradition of girls’ and women’s sport in Iowa with a travelling exhibit looking back at 6-on-6 girls’ basketball. For more information visit www.lib.uiowa.edu/iwa/25-years/.